We love having kids at the pool. In order to ensure a safe environment for families we ask that you and your children are aware and follow our kids pools safety rules. There will be a 15 minute “Adult Swim” at the end of each hour to allow children to rest and for adults to have a period in the pool without the interference of children. Only members and guests 18 years of age and older may be in the water during this break. Children younger than 18 must remain at least 6 feet from the edge of the pool until the lifeguard signals the end of adult swim. Parents may bring infants and toddlers into the water in the shallow part of the “L” during adult swim. Please be considerate of members trying to swim laps in the long portion of the pool. No child will be permitted in the deep water section of the pool unless he/she can demonstrate the ability to swim one width of the pool in good form and the ability to tread water for at least 30 seconds. Children may not pull themselves along the roping in deep water. 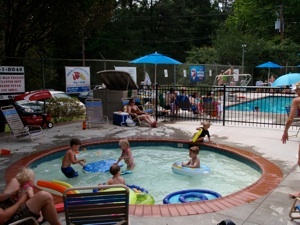 Kids must be 10 Years of age or older to use the pool facility without adult supervision. You must review the policy for this with your child and submit a consent form. Then your child must meet with a lifeguard at the beginning of the pool season to confirm that they have indeed signed the consent form. Only children 4 years of age or younger are allowed in the baby pool. It is not to be used by older children during adult swim periods. Lifeguards are not responsible for watching children in the baby pool. Children in the baby pool must be attended to by an adult at all times. Parents must sit within reaching distance of the child while the child is in the baby pool. All children not potty trained must wear a swim diaper. Parents of infants, toddlers, and young children are expected to clean up and thoroughly sanitize any area where their child has an “accident.” The guards will provide cleaning materials and directions. This includes the bathrooms. If an accident occurs in the water, bring it to the lifeguard’s attention immediately so that they can be of assistance. Discipline will be enforced by the lifeguards. Children who do not listen to the lifeguards will be found in violation of the rules and will be disciplined as follows. 1st violation –warnings and an explanation of safety rules to the child and parents will be notified;2nd violation- violator’s pool privileges will be suspended for the rest of the day and their parents will be notified in writing; 3rd violation- violator’s pool privileges will be suspended for the rest of the day and parents will be notified to appear before the board to appeal possible loss of pool privileges. Children are not permitted in the kitchen or clubhouse without supervision.